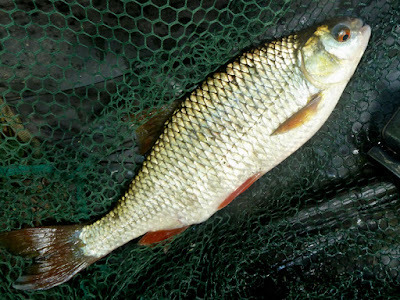 On the weekend I headed out in search of a roach, I’m aiming to get 10 pound plus fish this season before starting my quest for a magic two. 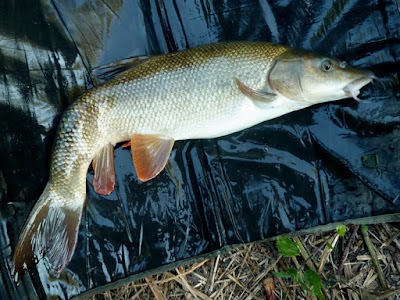 But in the bright daylight they didn’t want to play - so my back up plan was to search out a barbel. Long story short I caught 4, no monsters but they did include the curious fish above. I named him Boomerang Bob, I’ve seen a few with scoliosis before (here’s a Wye fish caught by Roger), but not one quite this bent. It was in great condition and fought well, I didn’t realise it was different until it slipped over the net. I’ve done a quick Google search but I’m having trouble finding out more about the condition - so if anyone in Blog Land has any links please add them in the comments - thanks. As evening approached I went back to the roach fishing, landing three to 15½oz - so close to adding a second pounder to the target! can be caused by bad handling.had a koi in the pond like it for years with no ill effects,and there was a double in the lea that put on a pound in a few months. Bent barbel are everywhere but yours takes the biscuit. There was some evidence that electrofishing caused some of these anomalies but that's not the case in the Wye so it's either natural, through bad handling or it's a pole dancing injury. I couldn't resist asking if they'd caught anything - then just sat there with a stupid grin on my face for five minutes - simple things please simple minds! Was wondering if a disease caused it, you'd have thought the amount of bad handling to cause this would kill it. But you're right it was probably a pole dancing injury! fish+bent+back produces some interesting results concerning "bent spine disease" from... aquarium fish forums (cf. nitrates/water quality, inbreeding, etc). "Generally, this is a birth defect caused by bacteria that attacks the spine in young fish. If they survive the attack (most die), they will live on and grow and feed as normal to an old age, but they will be handicapped or crippled. The disease/deformity is known as Scoliosis or Lordosis depending on the curve shape. Similar deformities like this can also be caused by internal tumours that bulge out from the inside of the fish. Other reasons/suggestions are hereditary, genetics, trauma to the spine, electrocution, overuse of organophosphate insecticides like Trichlorcide or Dylox, and malnutrition." Don’t know how true it is but he seems to know what he’s on about. Ray, a one time barbel record holder and perfecter of the rolling meat method (and inventor of the 'Rolling Pin' reel that allows long casts with a pin), is a top angler and ecological activist who spends much of his effort trying to preserve the Hampshire Avon. He's a divisive character but a huge force in the barbel scene not so long ago. Do a Google 'video' search Brian. I didn't mean any disrespect, didn't have time to look up the name behind the facts - I'll look him up at lunch. I wasn't having a go Brian, it's just a comment on how transient one's fame can be in the fishing world. i can vouch for dave and ray.their work in barbel circles is immense.as for the koi,it developed as opposed to had it from birth.never dropped,but was probably weighed a few times in my youth.